Having long before earned his sea legs, first aboard the Marianna Maru on the trade routes of the China Coast in the late 1920s, and then aboard the four-masted schooner, Doris Hamlin in the Caribbean, Ron was well familiar with the skills of sailing. But the vessel Ron had chosen for the expedition, the Magician, was less than a quarter the size of either the Marianna Maru or the Hamlin, and therefore more susceptible to the elements. 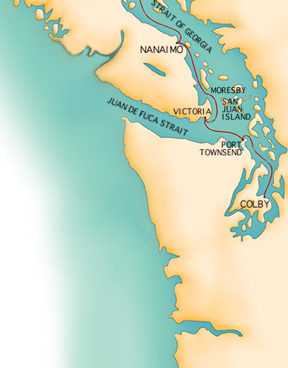 In fact, there were those who considered Rons choice of vessel well under an adequate size to face the weather and seas of the British Columbian and Alaskan coasts. 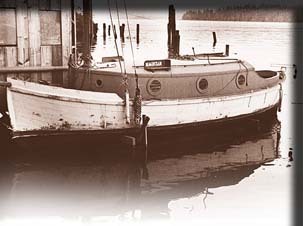 Most preparations for the expedition were completed while Ron was in New York and handled via written communication with a small boatyard in Puget Sound. They primarily consisted of refitting the Magician--which Ron had nicknamed Maggie. "If we have a boat at all,"" he wrote, "we had better have one that wont put our necks in the drink or starve us or fail us, for when you are playing with Old Man Sea you have a wildcat by the whiskers." Magicians modifications  each of which Ron fully researched and designed  included altering the hull for greater speed and maneuverability, installing a new and more powerful engine, rebuilding crew accommodations for comfort and livability and replacing worn sails and tired rigging. For instance, he ordered that the smaller of the ketchs two masts be removed and a larger mainsail fitted to provide more sail power and ease of handling. The refitted oak-and-cedar Magician proved faster under sail than most of the racing yachts in Puget Sound. To compensate for the lightness of her keel (which at 80 pounds was considerably smaller than the keels of other yachts of her size), the Magician was ballasted with iron bars along her bilges. Strategically placed, the 500 pounds of iron bars augmented her vertical stability with the equivalent righting force of two tons of lead hung at the bottom of the keel. As a result, in mild breezes she sailed virtually upright, allowing her to capture the maximum amount of wind and increase her forward velocity. To increase the efficiency of the Magicians sails Ron designed and installed a unique sleeve-like arrangement made out of sailcloth. By wrapping this sleeve around the mast and attaching it to either side of the mainsail, a smoother airflow was created around the mast and on to the sail. This in turn resulted in the forward edge of the mainsail (which contributes the majority of the sails power) receiving a much less turbulent flow--a primary factor in sail efficiency. To test the Magicians seaworthiness and his design and ballast changes, Ron sailed the Magician into 28-mail-an-hour winds. With sails trimmed flat--a condition in which most vessels of her size would have capsized  she heeled only modestly. The installation in the cabin of a radio receiver supplied by RCA. The Cape Cod Navigator, as it was called, was the latest type of radio direction finding equipment used by navigators to determine the direction from which radio signals were broadcast. Thus equipped, by the end of July, the Magician was ready to embark on the perilous journey northward to Alaska.